Al Qaeda in the Indian Subcontinent (AQIS) claimed that Pakistani Navy officers were involved in the failed attempt to hijack a Pakistani warship and launch missiles at US Navy vessels in the Indian Ocean. AQIS' spokesman, Usama Mahmoud, made the claim today in a statement released on his Twitter account. Mahmoud's statement was obtained by the SITE Intelligence Group. Mahmoud had previously claimed on Sept. 13 that AQIS executed the attack on the Pakistani warship, and published a diagram purporting to show the layout of the PNS Zulfiqar. He said that the attackers had planned to take control of the PNS Zulfiqar and launch missiles at US warships in the Indian Ocean. The PNS Zulfiqar carries at least eight C-802 surface to surface anti-ship missiles. While Mahmoud's claim that Pakistani naval officers executed the attack on the PNS Zulfiqar cannot be proven, Pakistani officials and press reports indicate that at least some of the attackers are members of the Pakistani military. Yes, Bill is quoting a AQIS spokesman so take those comments for what it they are worth. However, even if they are mostly a tissue of deceit, there is still the underlying premise of the remarks - that AQIS thinks there is a way to hijack a modern technology to threaten U.S. naval forces operating in the vicinity. Disturbing. On the other hand, U.S. naval forces are now forewarned. The F-22P or Zulfiquar-class frigate (Urdu: ذوالفقار ‎ English: Sword class), is a general purpose frigate built by Pakistan and China for the Pakistan Navy (PN). They are an adaptation of the Type 053H3 frigates of China but include elements of the Type 054 frigates as well. The frigate's primary surface-to-surface missile armament comprises eight C-802 subsonic anti-ship missiles carried in two launchers with four cells each, fitted between the foremast and the funnel. Built by China. Those box launchers circled in the nearby photo contain the C-802's. The Ying-Ji-802 land attack and anti-ship cruise missile [Western designation SACCADE], is an improved version of the C-801 which employs a small turbojet engine in place of the original solid rocket engine. The weight of the subsonic (0.9 Mach) Yingji-802 is reduced from 815 kilograms to 715 kilograms, but its range is increased from 42 kilometers to 120 kilometers. The 165 kg. (363 lb.) warhead is just as powerful as the earlier version. Since the missile has a small radar reflectivity and is only about five to seven meters above the sea surface when it attacks the target, and since its guidance equipment has strong anti-jamming capability, target ships have a very low success rate in intercepting the missile. The hit probability of the Yingji-802 is estimated to be as high as 98 percent. 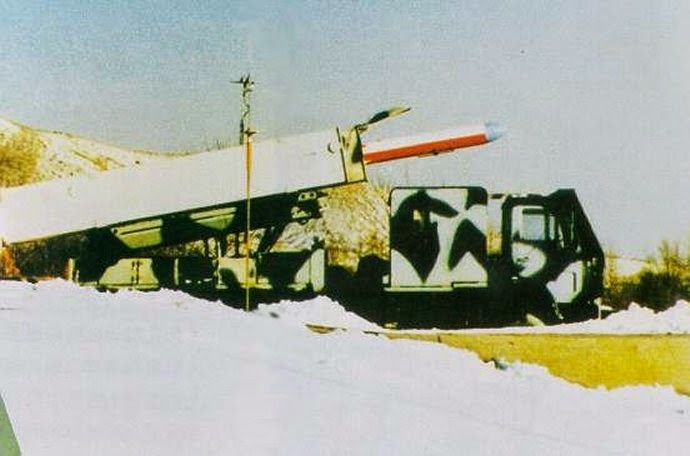 The Yingji-802 can be launched from airplanes, ships, submarines and land-based vehicles, and is considered along with the US "Harpoon" as among the best anti-ship missiles of the present-day world. Photo shows a C-802 launching from a from truck mounted box launcher. That Pakistan Frigate is quite new and interesting. Well, if they tried it, might make for some pretty good ASUW practice for the fleet. We don't get that kind of target very often. First, you have to be aware that you might be attacked and be ready to respond. As Captain Hughes has pointed out, the rule of success is "attack effectively first." Under the circumstances offered by a rogue ship, readiness on the vessel targeted by the rogue ships is everything. Of course, the navy whose ship has been "acquired" by bad guys should let the world know in a timely fashion- but one can easily imagine circumstances where that might not be possible. All true. Still, assuming we know that there's a problem, might make for a fun air-sea targeting to kill scenario. If NCA would let us, of courser.